The IFA 2018 show in Berlin is bursting at the seams with smart speakers. 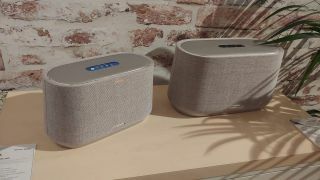 But with its new Citation speaker range, Harman Kardon has enough Google Assistant-enabled speakers to do an entire show of its own. Set to compete with Sonos systems thanks to their multi-room capabilities, the Citation range is a bit of a jack of all trades, with speaker sizes and colors to fit all tastes, voice control smarts, LCD touch controls and the ability to be paired up as a wireless 5.1 channel home theatre system. So, deep breath – let’s break down the range. First up, the Harman Kardon Citation One. Sharing a name and a price with Sonos’s speaker at $199, it’s your entry point into the range. It has Google Assistant and Chromecast built in for smart streaming and easy multi-room set up, and supports 24bit/96kHz sources. Increasing in size, price, output power and functionality as their model numbers go up, you’ve then got the Citation 100 at $300, the Citation 300 at $400 and the Citation 500 at $600. All feature Google Assistant and Chromecast, but the Citation 300 and Citation 500 also include an LCD touch control strip along their top edges, letting you swipe through tracks, control sources and see artwork among other uses. You then jump up to what you’d consider the more traditional home cinema elements – the Harman Kardon Bar costs $1,000 and is a three channel system, packing in 4K HDR support from its three HDMI inputs. It however can also act as a single centre channel when paired with the Harman Kardon Citation Tower speakers, which come and a pair for $2,500, each with a dedicated subwoofer and one with a touchscreen panel. It’s all finished off with a Citation wireless subwoofer, for a potential complete 5.1 set when setting up other models in the range as wireless rear channels. It’s an attractive looking range – each is finished in a high-quality, dust-resistant fabric, giving them a softer look than the sometimes–industrial stylings of other home theatre kits. While the soundbar and towers come only in grey and black colors, the smaller speakers in the range can come in a wide variety of shades, from rich burgundy to coral pink. It’s clearly a range where Harmon Kardon is doing it’s all to please all comers. As for the sound, it’s always difficult to discern at a noisy trade show. But, having sat through a scene of the recent Jumanji film with the speakers set up in a 5.1 sat up using the tower speakers as left and right channels, we can certainly attest to its power. Seeing The Rock (sorry, Dwayne Johnson) traverse the jungle pursued by leopards and a ring of fire, the roars and big cats and big motorbikes travelled around us well. An earlier listen to the tower speakers in a simpler stereo set up, with a selection of tracks ranging from Jamiroquai to Fleetwood Mac, showed them to be wonderfully warm and rich, with an astonishingly powerful bass response. It’s a wide range, and a trade show floor isn’t the best place to discover the nuance in so many products at once. But it’s an incredibly promising, attractively designed line up. We’re looking forward to hearing more from them.